Deodorant Comfort Bath Washcloths are the best of the best! 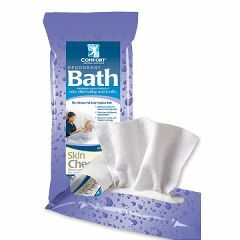 Comfort Bath cleansing is also available with advanced odor elimination! It's the ultimate cleansing solution for any patient—especially those with problem odor. Exclusive, water-based ingredient—Exopheryl™ Odor Eliminator—surrounds and entraps odor molecules, instead of masking them with fragrance. Powerful, proven deodorizing action! Over the course of eight hours, Exopheryl was found to be twice as effective as standard deodorant alone. Eliminates the need for additional deodorizing hygiene products. Increases satisfaction. Helps make the healthcare environment more pleasant for patients, staff and visitors by eliminating offensive odors. Rinse-free cleansing and moisturizing with aloe and vitamin E.
Dermatologist-tested formula; proven hypoallergenic, gentle and non-irritating. trying to find product used in hosptial. Washup cloth with package numnber 7989.